Cheesy Risotto balls in a crisp breadcrumb coating, with a sweet and tangy tomato relish on the side. Place KNORR Pronto Napoli, brown sugar, apple cider vinegar, star anise, ground coriander and mustard seeds into a saucepan over medium heat. Cook, stirring for 10 minutes or until sugar has dissolved. Bring to the boil, reduce heat to low and simmer for 20 minutes. Heat oil in a large saucepan over medium heat, add onion and KNORR Garlic Puree and cook until the onion is translucent. Add rice and sauté for 1-2 minutes. Combine KNORR Concentrated Liquid Stock and warm water. Add a ladleful of hot stock to the mixture and stir until liquid is absorbed. Continue to add stock a ladleful at a time stirring constantly for around 20 minutes or until rice is tender and liquid almost absorbed. Stir through parmesan, set aside for 1-2 hours to cool. Mould into balls and deep fry for 2-3 minutes until golden. 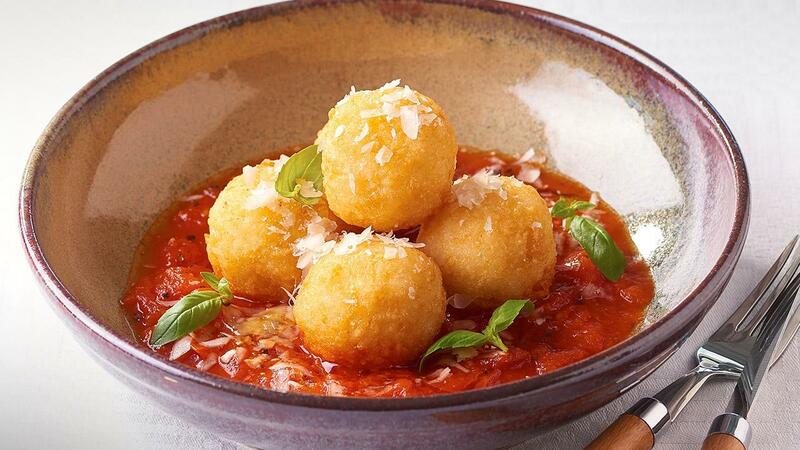 Place arancini balls on a bed of tomato relish. Serve with grated parmesan and fried basil leaves.